Suitable for casual or sport wear. Please compare the detail sizes with yours before you buy! Use similar clothing to compare with the size.Coofandy suggest you select a bigger size according to the Size chart. S Size: Shoulder: 18.7"---Sleeve:8.7"---Chest:41.7"---Center Back Length: 30.2"
M Size: Shoulder: 19.3"---Sleeve:9.1"---Chest:43.7"---Center Back Length: 30.7"
L Size: Shoulder: 19.9"---Sleeve:9.4"---Chest:45.7"---Center Back Length: 31.2"
XL Size: Shoulder: 20.5"---Sleeve:9.8"---Chest:47.6"---Center Back Length: 31.7"
2XL Size: Shoulder: 21.1"---Sleeve:10.2"---Chest:49.6"---Center Back Length: 32.2"
Extremely Soft: the men's hipster hip-hop t-shirt lightweight and flexible, breathable fabric provides exceptional comfort and durability. 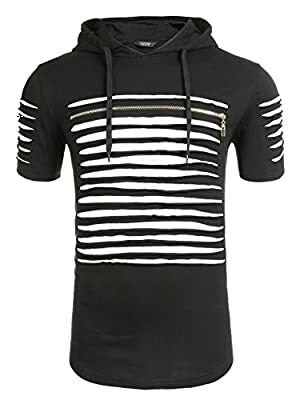 Latest Trend Hoodie: Specially designed for a stand out appearance, COOFANDY BRAND fashion Hoodies are manufactured using the most advanced clothing technology available today,amplifies your street style while promoting a sense of individuality. Unique Features: contoured and side seamed for classic fit, this fashionable hoodie includes side-seams, double-needle stitched sleeves, and bottom hems for lasting quality. Its soft fabric provides excellent comfort and can be worn in any occasion. 100% Money Back Guarantee:If , for whatever reason, you are not happy with COOFANDY BRAND clothing, just return it for a full refund (or replacement if there is a problem). We strive to offer the best value and service possible. Washing Tips: no shrinkage after normal hand(Max 40°C) or machine wash. Gentle washing program,regular dry cleaning,hang dry, do not bleach.